THIS IS A WALKTHROUGH FOR: HOW TO BACKUP WORDPRESS DATABASE AND FILES FOR MOVING LIVE. This is a detailed process of how to move your wordpress site to another server. 1.) First I go to godaddy.com or log into cpanel or whatever server management system is available, and open the database with phpMyAdmin on the development site/old server. 3.) 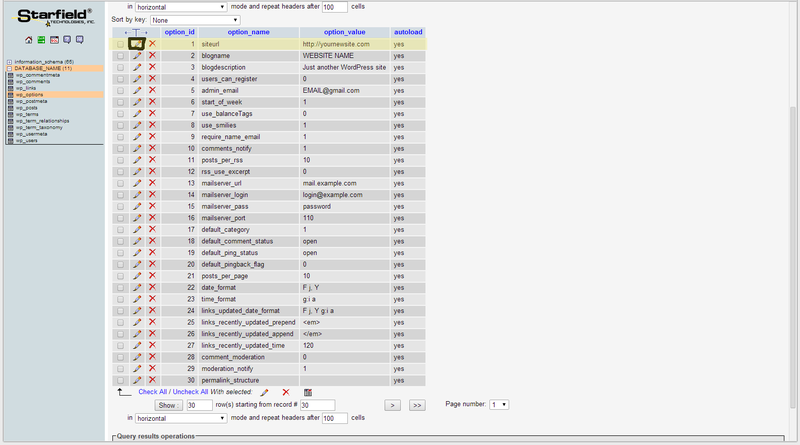 Select the table (usually on the left) NOT labelled information_schema, and click "Export"
4.) Do an export to text, meaning DO NOT export to file, and in the next window copy and paste the sql into an editor of your choice (Notepad, Notepad++). Now here is the trick, save the file as a .sql file, but be sure to delete the two lines that resemble: i.) " CREATE DATABASE `db_name` DEFAULT CHARACTER SET utf8 COLLATE utf8_general_ci; ii.) USE `db_name`; " - Note: The reason you delete these two lines is because if you don't you run into a problem when trying to import the database into the new database on the new server. 5.) Then save the .sql file again. Now, make a backup of the file system / directory structure by downloading everything in the root of the server to your computer as a backup. Wait for the file transfer to finish and move on to the next step. Now, here is where some things can go wrong, but as long as you have a good backup there should be no problem. At this point you can also make a backup of WordPress using plugins which is explained at the bottom of this page. We must change some values in the WordPress database so that we can log into the site. 3.) Select the table (usually on the left) NOT labelled "information_schema", and click "Import"
4.) Select the .sql file you saved earlier and complete the import. 7.) Look for "siteurl" field and click the little pencil to edit the entry. 9.) Once finished editing the "sitrurl" click "Go" to finish the edit. 10.) On the next page, Look for the "home" field and click the little pencil to edit the entry. 12.) Once finished editing the "home" click "Go" to finish the edit. Once the files have finished moving (this is important) and the database "home" and "siteurl" entries have been set, you can log into http://yournewsite.com/wp-admin. You need to go to your permalink page and change your settings at least once. Therefore, if you have never changed your permalinks then you need to change it to something like "Post name" for the links to work properly. If you have already selected "Post name" in the past, then the best option would be to select "Default" which will return your pages back to using page ids, and then select your original choice gain. The idea here is to reset the page links back to IDs then to another permalink choice of your liking. If you DO NOT have access to FTP or DATABASE, but you have WordPress Administrative rights. Version 2.2.4 (POSTED ON - 3/2/14) | By Austin Matzko | Visit plugin site Just simply extract the zip and upload the extracted folder "wp-db-backup" to /wp-content/plugins via FTP To Use: Activate in WordPress -> Hover over "Settings" (in WordPress dashboard) -> Click on "Wordpress Backup" -> Set Interval and email (optional) -> Click "Update WordPress Backup Options" -> DONE! Version 1.6.4 | By Blog Traffic Exchange | Visit plugin site Just simply extract the zip and upload the extracted folder "wordpress-backup" to /wp-content/plugins via FTP.WARNING: The BTE plug-in creates a folder called "bte-wb" in the /wp-content/ folder. (Location: /wp-content/btw-wb/) To Use: Activate in WordPress -> Hover over "Tools" (in WordPress dashboard) -> Click on "Backup" -> Scroll down to "Backup Options" -> Select "Save to Server" radio button *FIRST* -> WAIT FOR THE BACKUP TO FINISH *OR ELSE* -> DONE! Wordpress Backup, Moving Wordpress, or Moving a development site Live. This is a detailed process of how to move your wordpress site to another server.